Modern jazz favorites showcased in Contemporary Ensemble concert - CANCELED! 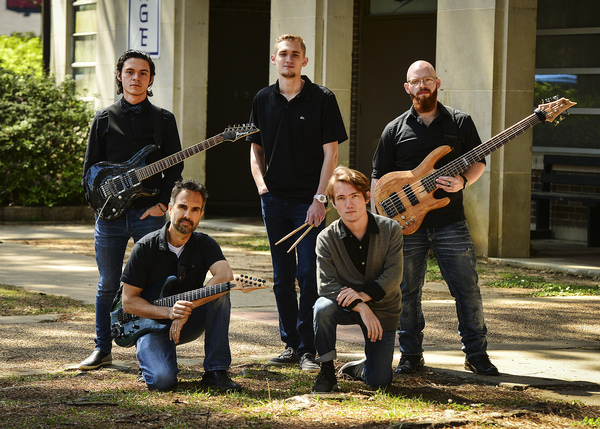 The Contemporary Ensemble at SFA will perform a program of modern jazz at 7:30 p.m. Thursday, April 26, in Cole Concert Hall on the university campus. This concert by the Contemporary Ensemble at Stephen F. Austin State University, originally scheduled for 7:30 p.m. Thursday, April 26, in Cole Concert Hall on the SFA campus, has been canceled. For more information, call the SFA Fine Arts Box Office at (936) 468-6407. "I chose this theme because jazz is some of my favorite music to play and to listen to," said Andrew Sperandeo, Sound Recording Technology and guitar instructor at SFA and director of the Contemporary Ensemble. The program will feature Jaco Pastorius' "Portrait of Tracy," a piece Sperandeo describes as "beautifully written." The solo bass instrumental showcases "the multifaceted talents of the late great Pastorius." "It has always been important to me as an educator to try to expose students to artists they would most likely never encounter in their own musical pursuits in order to broaden their perspectives as musicians," Sperandeo said. "Our arrangement of this piece has been expanded to include our full ensemble based on Brian Bromberg's arrangement." The ensemble will also perform "Are You Going With Me?" by Pat Metheny. "Growing up, Metheny was always one of my most favorite, well-rounded musicians, and he continues to be so," Sperandeo said. "Competent player, composer and arranger, his work has inspired me to pursue the development of these same skills." Sperandeo arranged this Metheny piece based on a "haunting recording" on the "Upojenie" collaborative album with Polish folk and jazz singer Anna Marie Jopek, on which Metheny played. "It has quickly become my favorite version of this tune," Sperandeo added. Also on the program, Chris Potter's "High Noon" contains a lot of "attitude and personality," Sperandeo said. "This medium groove tune, with dark changes and odd time signatures, is a lot of fun to play," he said. The concert will also feature music by Michael Brecker and Mike Stern and an original piece.